The 2016-2017 PBA Philippine Cup Finals kicked off with a purr as the San Miguel Beermen completely dominated the Ginebra Gin Kings in Game 1! 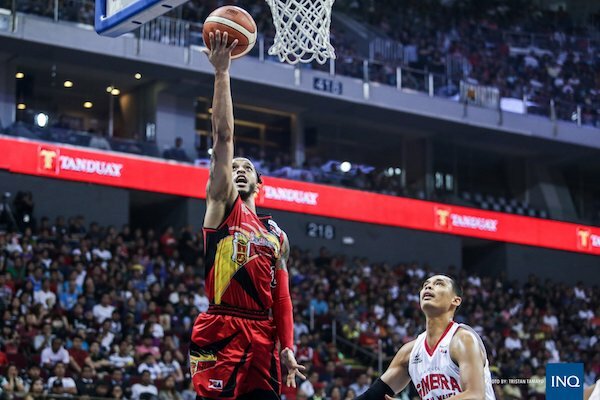 The San Miguel Beermen overwhelmed Barangay Ginebra early before cruising to the comfortable finish as they downed the Kings, 109-82, in a lopsided Game 1 of the Oppo PBA Philippine Cup Finals on Friday at the Mall of Asia Arena. Reigning PBA MVP June Mar Fajardo and Chris Ross each finished with 17 points to lead San Miguel. "The Kraken" shot 7-for-8 from the field and grabbed a game-high eight rebounds despite playing in less than 23 minutes of the blowout contest while Ross posted five rebounds and dished out eight assists in a similarly impressive showing. Alex Cabagnot hit three three-pointer en route to 16 points while Gabby Espinas also finished with 16 markers, though all of his came in the second half. San Miguel opened the game on a 17-2 run and never really looked back in a game they led by as many as 36 points. Chris Ross (SMB) - 17pts, 5rebs, 8asts, 1blk, 1 triple. Chris Ellis (GIN) - 13pts, 3rebs, 2asts, 2stls, 1blk, 1 triple.